"The water in a vessel is sparkling; the water in the sea is dark. The small truth has words which are clear; the great truth has great silence." I was a bit disappointed I missed the Winter Lights at the Elizabethan Gardens due to the rain, but a sea urchin at the NC Aquarium performed a light show for me instead. I wasn't expecting the sparkles to appear when I took the shot. That picture came out really cool with the sparkles. I love it. OH my, how beautiful.Glad it put on a show for you. Your site is new to me and I just love it!!! Hope we meet again. Have a great holiday season and will see you in the New Year! An awesome shot Kristin! So beautiful! Thanks for hosting. Pretty! That's not something you see everyday, which makes it all the more beautiful! wow that's gorgeous! Merry Christmas! I had no idea they could be so pretty! Love the soft, blurry effect! Really pretty! Oh, this is such a cool picture! Thanks for hosting and have a Merry Christmas, my friend! Thanks 4 hosting this nice project. Oh my dear I missed you this week. Glad you came to me. Dang! Sorry about that. Have a great week. That is so beautiful! 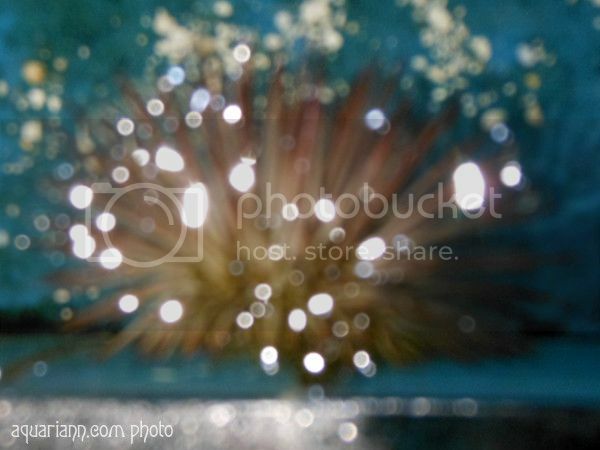 It's really cool that's a sea urchin. I never would have guessed.